The subject is Hidalgo; the interviewer focuses on Viggo Mortensen's modest manner. "Mortensen is a bit like Aragorn, the Lord of the Rings character he imbued with warrior grace and more than a bit of ambivalence. He seems primed for a kingdom. Yet Mortensen doesn't appear to need the glory. He's happy forming alliances. He's comfortable doing the work. He's not quite as at ease promoting the work, or rather himself." Interview about Hidalgo touches on mythology and philosophy of life. When asked about whether it troubles him that the facts behind the film are in question, he points out that "our identity as a nation is largely based on myth, on storytelling, making up stories, exaggerating the accomplishments of extraordinary individuals," and goes on to talk about the themes of tests and ordeals in the film. Article and interview. After the release of Hidalgo, Viggo returned to South Dakota to participate in a trail ride and speak with Native Voice about the film, Miyelo, Native American culture, and the challenges facing people today. He also talks about the cost of stardom and his commitment to his fans: "You know, for me to look each person in the eye and listen to their question and answer them, and get their name right and be respectful—that takes a certain amount of energy for complete concentration.... At the end of the day you don’t have anything left, sometimes, for yourself. You have to find ways to hide out, that's all." Now, an even longer ‘Rings’! 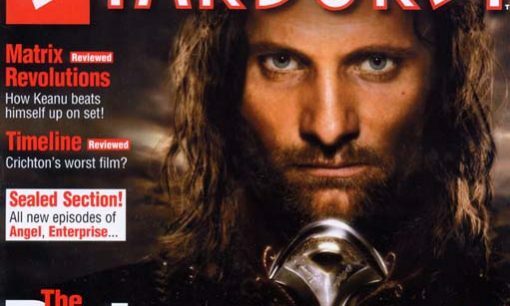 Comments from Viggo and other cast and crew regarding the filming of The Two Towers and their opinions of the extended version of The Fellowship of the Ring.